The Menorah: It’s Electric! (Boogie Woogie Woogie). As a kid in the suburbs, we could tell people’s religious backgrounds by their decorations of choice. The houses bedecked with blinking rainbow-colored lights and nativity scenes were Christians (the fervor of which could be measured in the quantity of plastic reindeer covering their roof). The windows twinkling with electric menorahs denoted the few token Jewish families. And of course, the house on the end of the block, with the darkened windows, boarded-up door, and permanently-barking dogs, was described by my mom as “not in the holiday spirit” (which I assumed meant they practiced Satanic rituals in the basement). 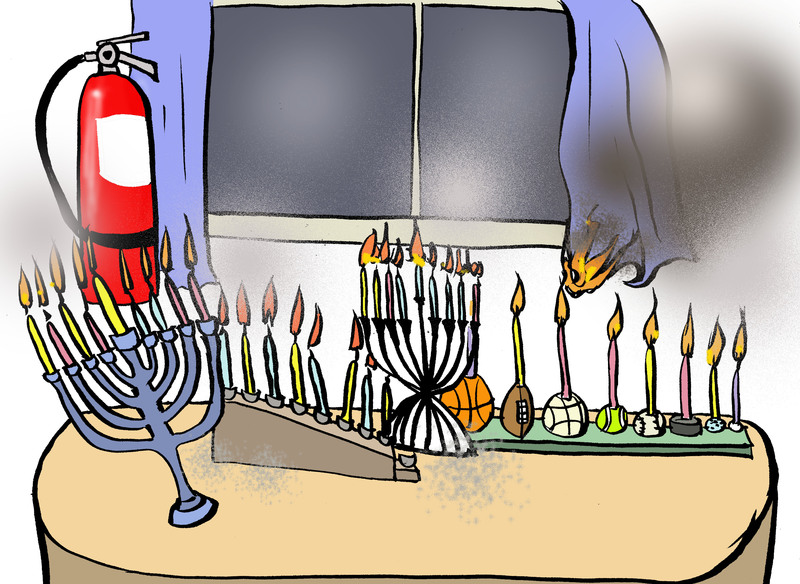 Living in a cramped city apartment with two small children, my husband and I decided that lighting an actual menorah would be a fire hazard (and we have just enough of the hoarder instinct that one badly-placed shamash could incinerate our living room). Hence our dollar-store electric one. Two years ago, we discovered that one of the bulbs had burned out. We forgot about it, until we reached the last night of Hanukkah, when I twisted it and remembered, oh crap, I was supposed to buy a new one. As the night ended in anticlimactic incompleteness, we vowed to replace said bulb next year. Except we didn’t. This year, we dragged our busted menorah out of storage and stared at it with a kind of lazy disappointment, until my husband realized that our daughters’ nightlight used the same bulbs. Win! Hanukkah is saved, my kids can light the menorah from bed and have Maccabean dreams, and none of our neighbors will mistake us for Satan-worshippers. Its a great parallel to the oil….what wasn’t supposed to give light for 8 days does…thank goodness for night lights, and lights at night.